The Welsh celebrate St. David's Day this weekend, so it seems timely to note the birthdate of a Welshman. John Puleston Jones was born on this date in 1862, at Llanbedr. He was 18 months old when he became blind from an accidental injury. His mother (who wrote poetry as "Mair Clwyd") is credited with insisting that he learn independence skills in childhood. Puleston Jones was an excellent student through school, and after a year at the College for the Blind in Worcester he went on to Glasgow University and Balliol College, Oxford. He graduated with first-class honors in modern history. Puleston Jones was always interested in Welsh culture and history, and helped to found the Dafydd ab Gwilym Society at Oxford in 1886. In 1888 he was ordained as a pastor. He served in various churches, published his sermons and theological essays, and wrote articles for a Welsh pacifist periodical (Y Deyrnas) during World War I. He is best remembered today for devising adaptations of Braille to fit the Welsh language--adaptations that apparently remain in use today. Today, a plaque marks the house where the Rev. Dr. Puleston Jones was raised, in Bala. The BBC recently introduced new presenters on their popular children's show, CBeebies: Alex Winters and Cerrie Burnell. They're pictured at left, in a publicity still. Both young, white, conventionally attractive, with big grins for the camera. They're dressed in kid-friendly purple and green sweaters, sitting on a comfy couch with satiny pillows. And Cerrie has a noticeably short arm, ending just below the elbow. Well, that last detail of the picture is apparently a problem for some parents. They say her appearance is "unsuitable" for a children's show, that the sight of her will "scare" children, even to the point of giving them nightmares. Complaints have been filed. Message boards on the subject brim with panic and ignorance. And it is the parents' problem, not the kids' concern: as Lucy Mangan writes about physical difference in a Guardian editorial on the subject, "To a young child, it is just another element of a large and confusing world that they want to inquire about, no more fearsome or embarrassing than any other." So, of course kids are going to ask, that's what they do--and they're going to take their cues from how their parents answer those questions. Not just the words, either, but the tone, the body language--I posted some tips here a few years ago. And think about this--if you're telling your children this lovely young woman is too frightful to behold, what are you telling them more generally about beauty? about perfection? What kind of impossible box are you asking them to fit into, and stay inside, for your approval? 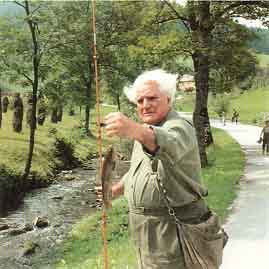 Austrian sculptor Gustinus Ambrosi was born on this date in 1893, at Eisenstadt near Vienna. He was a musical prodigy before he contracted meningitis at age 7; he survived with "total deafness." The boy soon turned his artistic inclinations to sculpture: as a teenaged apprentice, he studied sculpture at night. Soon, he'd produced his first sculpture of note, titled "Man with the Broken Neck." While still a teenager, he won a prestigious national prize for sculpture. Ambrosi went on to create over 3000 works, at least 600 of them portrait busts of many of the leaders of European politics and culture in the 1930s. The story goes that he was allowed to work on his bust of Mussolini during closed government meetings, because it was understood that he could not overhear any confidential discussions. He maintained studios in Vienna, Rome, Paris, London, and Brussels in his lifetime. For the 100th anniversary of Gallaudet University, Ambrosi was commissioned to create a sculpture of Edward Miner Gallaudet. Ambrosi also wrote and published volumes of German poetry. Today, there is an Ambrosi Museum in Vienna, dedicated to the display of his works. His friend, composer Erich Wolfgang Korngold, wrote a piano quintet dedicated to Gustinus Ambrosi. Last Sunday, I was moved to post about Flickr and disability history; today, I'm watching another online forum for user-generated content. It's hard to get mainstream news cameras to point away from the red carpet on Oscar weekend; but it's not hard to put a video on YouTube, and quite a few videos from the Jerry Lewis protests are already up (as I type this, the Oscars haven't started yet). Here's a digest of the ones I can find. DESCRIPTION: These involve long interviews with Sarah Watkins, Simi Linton, Laura Hershey, and others, articulating the points of the community's objections to a humanitarian award going to Lewis. The visuals involve a lot of bright fluorescent posterboards and crowds behind the interviewees. It's widely noted in disability history that the problem with finding primary sources isn't their existence--the stuff is out there, but it's hard to find in catalogs, older finding aids may not mention such content, etc. Then there's the Flickr Commons project. 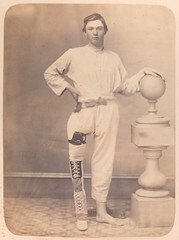 The photo above, of a Civil War veteran whose shortened right leg is inside a brace, with a prosthetic foot, is from uploads at Flickr Commons from the US Sanitary Commission collections at the New York Public Library. Because it's a Commons project, you and I and anyone else can add tags like "disability" and "disabled veteran" and "prosthetics" to such images, so they can be found by others with those interests; if you know something about, say, the kind of bracing displayed here, you can explain it in comments, and so can anyone else who has something to add. It's crowdsourcing, and it's a great chance to put disability history into the information that accompanies images like this. Disability Blog Carnival #53 (February 2009) is up NOW! Twxee called for potluck, and she got a great spread of casseroles--er, posts--to share for the February Disability Blog Carnival. Go have a taste! You can go back for seconds, thirds, fourths... and you don't even have to help with the dishes afterwards (but Twxee invites the help anyway). The March carnival edition will be hosted at CharmingBB, who is particularly interested in posts on the theme "If I knew then what I know now...." But since we've gone to a monthly schedule, we'll generally be inviting a broad range of submissions, so feel free to send links to your best new posts for consideration, between now and the deadline (March 6), at the blogcarnival.com form (WARNING: CAPTCHA), in comments here or there, or by email (see CharmingBB for the address). Or put "Disability Blog Carnival" in the text of your post, I usually find those, too. Yanub, Lexie, I think you both volunteered to take further editions--but I didn't get you into the system yet, so email me to confirm your months (April and May, in that order, most likely). Scratched Paint on a Lamborghini? Apparently, in the eyes of the Academy of Motion Picture Arts and Sciences, decades of incessant, patronizing, condescending pity and outdated representations of people with disabilities are the equivalent of "some scratches in the paint job...of a Lamborghini." Go check out more of this delightful analogy at TheTroublewithJerry.org ... it's not too late to sign the petition or join the Oscar-weekend protests of this "humanitarian" award. In the 1890s, states and counties in the US were locating asylums away from towns. It was justified as a more healthful location, with the opportunity for therapeutic and cost-effective agricultural labor; it was also popular as an "out of sight, out of mind" solution, given the general fear of people with mental illnesses. One consequence of this location choice was that the staff generally lived on the grounds of the asylum; another consequence was that, in the event of a disaster, there was no nearby community to come help. The fire conveys the sad lesson, patent to all, that the custom of isolating the county workhouse miles away from the town centre is something which cannot be longer tolerated in this enlightened age. An investigation by the state board of health also noted rampant alcoholism and incompetence among the asylum staff, and the practice of furnishing matches to inmates who smoked (as Mrs. Lafontaine did), as further factors in the disastrous fire. The county asylums in New Hampshire were abolished in part because of the board's findings, and replaced with state-run asylums. *The various new accounts don't have matching counts of the dead.